Link4Fun Cards draw on Universal Design for Learning Guidelines—a widely endorsed educational framework that seeks to optimize the learning process by translating current research into effective practice (Meyer & Rose, 2015). The cards are also based on language acquisition research related to the visual and cognitive processes that underlie word learning. The Link4Fun Cards were designed using novel technology that pairs the advantages of children’s traditional print-based media with the interactive elements of audio, animation, and simple game play. This model is based on the American Academy of Pediatrician’s guidelines, which emphasize interactive and mixed media use over independent screen time for preschool aged children (AAP, 2016). 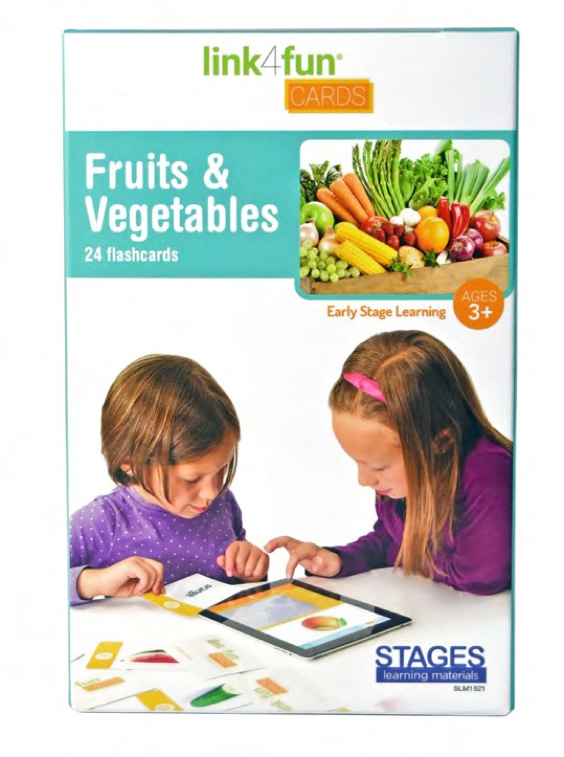 With the introduction of a new technology in the Link4Fun Cards, young children can learn new words by handling physical flashcards and being prompted and engaged through a digital application. This approach is intended to maximize the advantages of both tools and keep children actively engaged in word-learning activities with a supportive adult. The Link4Fun Cards collection includes sets for children, ages three and up. 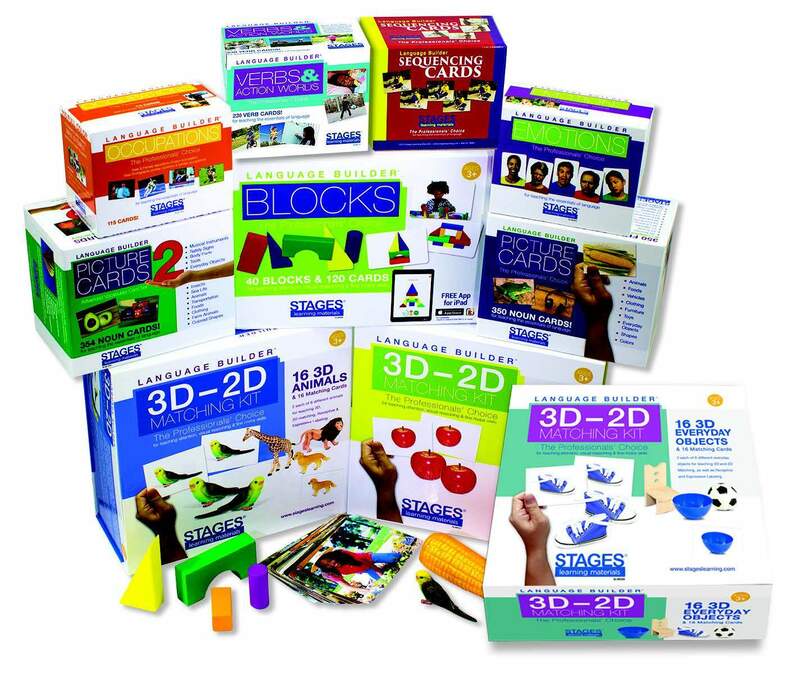 Available sets include: Dairy & Protein, Grains & Snacks, and Fruits & Vegetables for children to learn through visual, auditory, and tactile exploration. The Cards provide children with the opportunity to map the vocabulary word to an image and develop a more sophisticated schema for each item. Based on neuroscience research, it is clear that learning is enhanced when visual, auditory, and motor processes are integrated in this way. The Link4Fun Cards combine and connect traditional flashcards with a digital device to create an interactive learning experience for young children. The Link4Fun Cards set consists of printed flashcards that are held over an iPad. The digital media provides additional audio, which prompts the child to select a specific card or provides the audio to label an image or read a word on a card. The Link4Fun Cards do not require any special batteries or cords, instead they utilize a novel technology based on invisible ink that is printed on the flashcards and interacts with the digital device. Link4Fun Card technology seeks to combine the advantages inherent in print based and digital media. The cards themselves provide tactile-kinesthetic feedback and are designed for flipping, sorting, and further manipulating. With the advent of the touch screen, digital media can now provide multi-person participation and the chance for guided, interactive, and contextualized learning that can be done collaboratively in pairs or with a small group. The Link4Fun Cards are printed with invisible ink. The designs formed by the ink interact with a touchscreen on an iPad that has an app downloaded. Research shows that young children have difficulty dragging, dropping, and pressing buttons on digital screens (Joiner et al, 1998). The magic of the Link4Fun Cards and App instead relies on larger movements as children manipulate the physical cards. Link4Fun Cards were designed using research based best practices on emergent literacy and preschooler engagement. 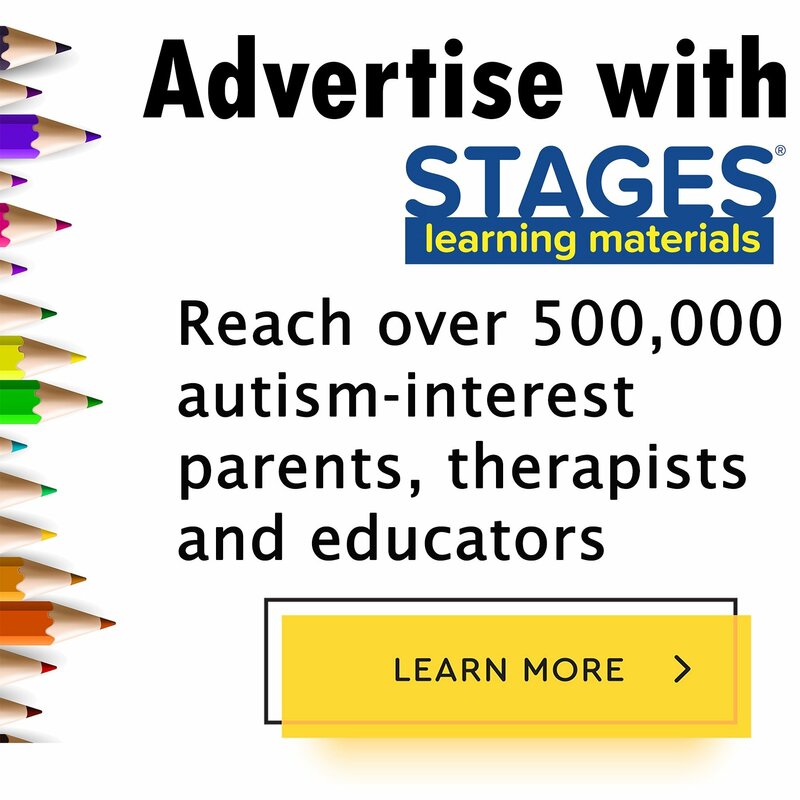 While only a small amount of research has been conducted directly using this new technology, much of the research on early word learning and multisensory educational methods informed the design of this product. Research demonstrates that children learn new vocabulary words by mapping an auditory stimulus to a visual stimulus. When an infant reaches for a cylindrical object that usually contains their milk, a parent says “bottle” as they bring it towards the child and feed them from it. This process, referred to as fast-mapping, is how children attach words to features in their environment (Carey, 1978). The Link4Fun Cards teach words in this way. The Cards can be used to label a vocabulary word based on an image (i.e. the child places a card with the image of a banana on the tablet and the app labels it “banana”). As this skill is mastered for a vocabulary set, the app can advance and help children match the written word with the stimulus. Through eight different learning activities, children learn new vocabulary words through picture matching, word matching, and eventually through sight-reading. Similar language games have been shown to enhance oral and written language development (Sulzby & Teale, 1991). Even when compared with traditional methods, digital media has been shown to improve word recognition (Reitsma & Wesseling, 1998). In 2016 the American Academy of Pediatrics issued a statement recognizing that interactive media, when carefully designed, can have educational benefits for children aged two and older and that interactive e-books and similar technology tools can improve “social skills, language skills, and even school readiness” (AAP, 2016). In a similar vein, a joint position statement by the National Association for the Education of Young Children (NAEYC & FRC, 2012) and the Fred Rogers Center for Early Learning and Children’s Media agreed that when appropriately used with adult supervision, interactive technologies can provide useful tools for early literacy and social development. Researchers believe one reason that digital media has not been more integrated into early childhood education is due to a lack of pedagogical knowledge on the part of teachers about how to effectively incorporate technology (Ertmer, 2005). The Link4Fun Cards circumvent this issue by simply incorporating technology into traditional flashcards. Teachers need only provide the students with an iPad and open the appropriate application when they review flashcards with a student. A consensus within the literature on educational technology is that digital manipulatives, pioneered by the MIT Media Lab and reflected in the Link4Fuun Cards, are beneficial in teaching young children concepts and skills that are just outside their zone of proximal development. (Lieberman et al, 2009). Physical manipulatives that are designed to interact with digital technology (such as the Link4Fun flashcards) are easy for young children to manipulate given their motor development, and easier to share with peers and adult mentors. Despite the concerns of many, research suggests that children interact with peers at least as much, if not more, while playing computer-based games compared to playing on the floor with puzzles (Clements, 1998). There is substantial evidence that children develop cooperative behaviors (e.g. sharing, turn-taking, showing) when they use technology in pairs (Bergin et al, 1993). Digital games are also extremely motivating. They hold the learner’s attention for a prolonged period of time and engage them emotionally and behaviorally for longer than traditional teaching methods (Prensky, 2007). Furthermore, their engagement is more sustained when they utilize digital platforms for educational activities (Judge, 2001). Young children also report high levels of enjoyment in computer- based learning activities (Liu, 1996). Even children with ADHD, whose attention can often wander, have shown high levels of sustained attention to digital educational activities, likely as a result of the immediate feedback that computer- based games can provide (Shute & Miksad, 1997). Link4Fun Cards were designed following Universal Design for Learning (UDL) guidelines as well as following best practices from current research on emergent literacy and word learning in preschoolers. 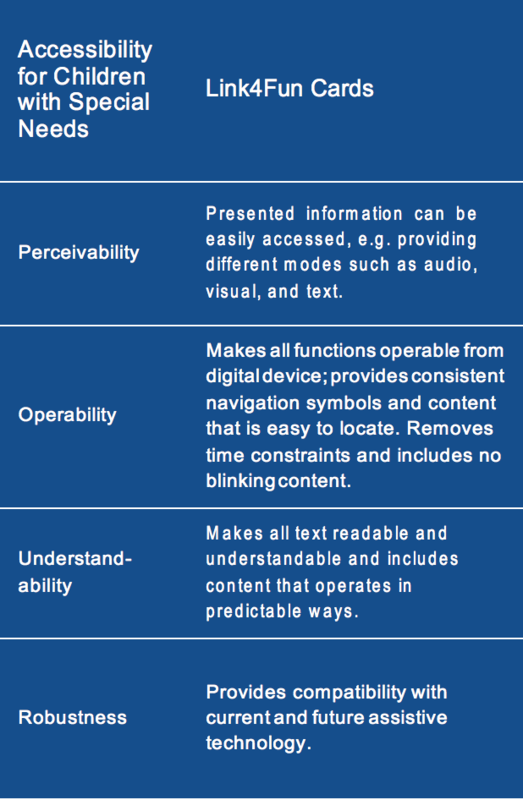 UDL guidelines include designing learning tools to enable children to experience multiple means of engagement, representation, and expression. Because the Link4Fun cards can be used in a variety of non-linear ways children are able to make choices about how they interact with the cards and they become active participants in their learning process by interacting with the Link4Fun app and cards in a variety of ways. The design of Link4Fun Cards has drawn on the wealth of best practices currently being developed at the Harvard Graduate School of Education Technology, Innovation and Education Program and the work of David Dockterman and his course on Innovation and Design. Research best practices have also been articulated by Barnyak and McNelly (2016) as well as the work of McManis and Gunnewig (2012) for the National Association for the Education of Young Children. The following tables provide connections between the current research recommendations and the Link4Fun Cards. Uses digital and print pictures, written words, and digital media to promote vocabulary development and early sight-reading. Places print near the graphic it describes. App and Cards connect and work together to enhance learning. Presents activities in play-like fashion. Stimulates engagement for purposeful learners; presents content in multiple ways so that children can interact with the flashcards on different levels depending on age and abilities, and provides opportunities to express learning through different types of activities. Because Link4Fun Cards are a new technology, the recommendations below are based on research to date on the use of interactive or multimedia e-books and research on the use of educational technology generally with preschool children. In particular, the following recommendations draw on the work of McManis & Gunnewig (2012) and Barnyak and McNelly (2015). + Demonstrate appropriate use of any technology. Link4Fun Cards requires basic iPad touch screen knowledge and the ability to place the flashcards over the designated area on the screen. Encourage children who understand how to use Link4Fun Cards to demonstrate its use to others and for children to engage the product in pairs or small groups. + Emphasize interactive and open-ended exploration of Link4Fun Cards. The flashcards can easily be used as a game, with each player or team working to identify the correct card. + As with any technology for preschool children, keep in mind that children need both interaction with adults and time to choose and shape their own learning and reflect on what they are doing. Teachers and caregiver are advised to check in with the child(ren) repeatedly to monitor their learning or provide additional motivation and instruction as necessary. + Use Link4Fun Cards in early childhood classrooms in a variety of contexts such as independent or paired word learning. Invite children to take turns with the flashcards and engage with them repeatedly to ensure mastery of each card set. + Adhere to age appropriate use: Link4Fun Cards are not recommended for children younger than 3-years old. + Pair other classroom or home activities with the content in the Link4Fun Cards such as using bananas or apples to teach basic number sense after the children have used the card set relating to these vocabulary words. 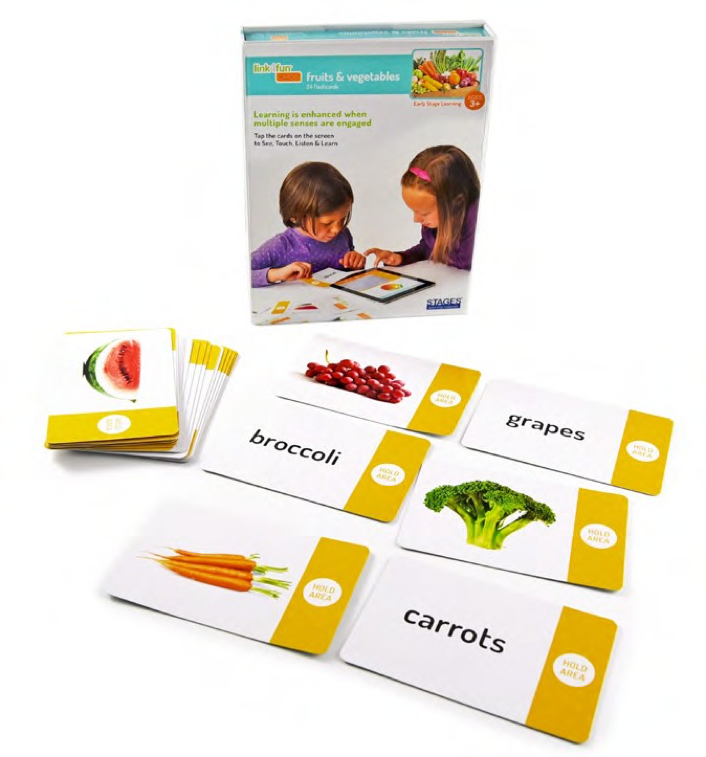 Link4Fun Vocabulary Cards are new language-learning tools, designed to scaffold preschool language development by synchronizing traditional manipulatives with digital media. 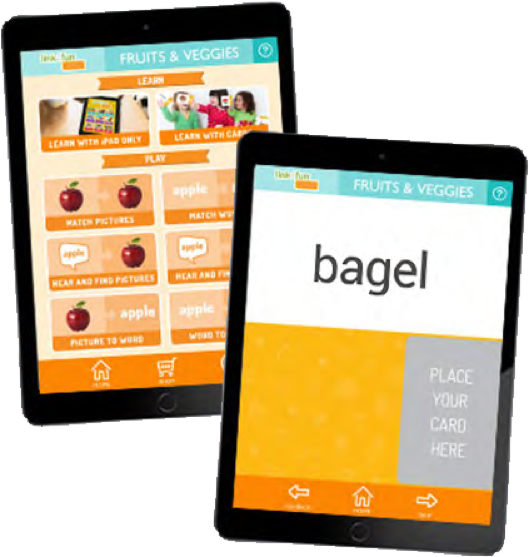 Children tap flashcards against the screen of a iPad to display interactive digital content that engages them sensorily and encourages them to continue learning. The Link4Fun Cards collection includes sets for children ages three and older. Based on current research the design of Link4Fun Cards allows for an engaging experience for preschool aged children to expand their receptive vocabularies and begin to associate spoken words, visual representations, and written words. Link4Fun Cards provide a highly kinesthetic learning environment to engage young learners, provide age-appropriate materials for learning, and enhance the age-old educational tool of traditional flashcards. American Academy of Pediatrics (2016). Media and young minds. Pediatrics. Barnyak, N. & McNelly, T. (2016). The literacy skills and motivation to read of children enrolled in Title I: a comparison of electronic and print nonfiction books. Early Childhood Education Journal, 44, 527-536. Bergin, D., Ford, M., & Hess, R. (1993). Patterns of motivation and social behavior associated with microcomputer use of young children. Journal of Educational Psychology, 85(3), 437–445. Carey, S. (1978). 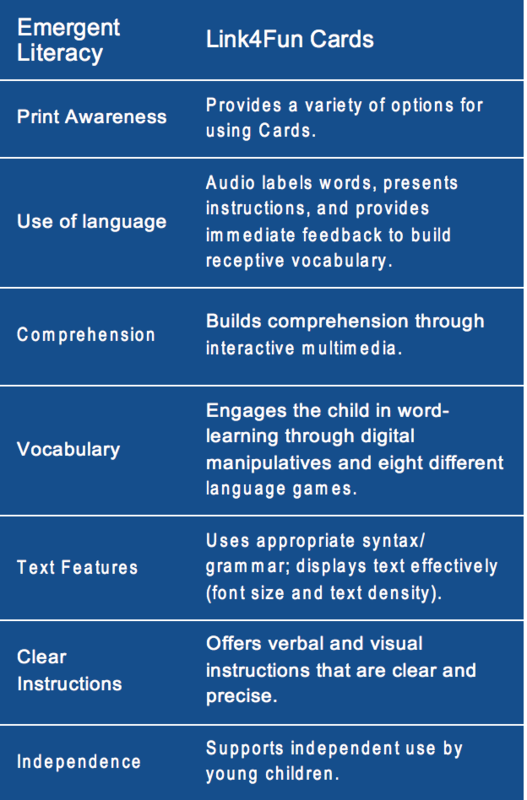 The child as word learner. In M. Halle, J. Bresnan, & G. A. Miller (Eds. ), Linguistic theory and psychological reality (pp. 264–293). Cambridge, MA: MIT Press. Clements, D.H. & Sarama, J. (2002). The role of technology in early childhood learning. Teaching Children Mathematics, 8(6), 340-343. Couse, L. & Chen, W. (2010). A tablet computer for young children? Exploring its viability for early childhood education. Journal of Research on Technology and Education, 43(1), 75-98. Ertmer, P.A. (2005) Teacher pedagogical beliefs: the final frontier in our quest for technology integration? Educational Technology Research and Development, 53(4), 25-39. Guernsey, L. (2007). Into the minds of babes: How screen time affects children from birth to age five. Philadelphia, PA: Basic Books. Haugland, S.W. (1992). The effect of computer software on preschool children’s developmental gains. Journal of Computing in Childhood Education. 3(1), 15-30. Hutchinson, A. & Reinking, D. (2011). Teachers’ perceptions of integrating information and communication technologies into literacy instruction: a national survey in the United States. Reading Research Quarterly, 46(4), 312-333. Joiner, R., Messer, D., Light, P., & Littleton, K. (1998). It is best to point for young children: a comparison of children’s pointing and dragging. Computers in Human Behavior, 14, 513–529. Judge, S.L. (2001) Integrating computer technology within early childhood classrooms, Young Exceptional Children, 5(1), 20-26. Lieberman, D., Bates, C. & So, J. (2009). Young children’s learning with digital media. Computers in the Schools, (26), 271-283. Liu, M. (1996). An exploratory study of how pre-kindergarten children use the interactive multimedia technology: Implications for multimedia software design. Journal of Computing in Childhood Education, 7(1–2), 71–92. McManis, L.D. & Gunnewig, S.B. (2012). Finding the education in educational technology with early learners. Young Children. Meyer A., Rose D. & Gordan D. (2015). Universal Design for Learning Theory and Practice. Kindle Book. Wakefield, MA: CAST Professional Publishing. Prensky, M. (2007). Digital Game-Based Learning. St. Paul, MN: Paragon House. Reitsma P. & Wesseling R. (1998) Effects of computer- assisted training of blending skills in kindergartners. Scientific Studies of Reading 2, 301–320. Shute, R., & Miksad, J. (1997). Computer assisted instruction and cognitive development in preschoolers. Child Study Journal, 27(3), 237–253. Sulzby, E., & Teale, W. H. (1991). Emergent literacy. In R. Barr, & D. Pearson (Eds. ), Handbook of Reading Research (pp. 727–758). New York: Longman.